In the year 2001 i started breeding of show-jumpers with 2 mares at our location in Pesse, The Netherlands. One of them was Naline (Polydox x Pilot) who was in foal of Dobels Cento. I knew her first descendant “Simon” who was then 4 years old. That was one of the reasons besides the “Pilot” blood to buy her. Now i can say that was a good decision. 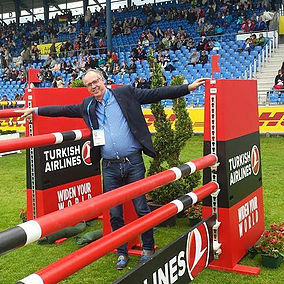 Simon developed into one of the best show-jumpers in the world and Naline produced many excellent show-jumpers. At present we have six broodmares. Naline passed away in 2016. All our broodmares come from proven mare lines where sport is anchored. My goal is to breed quality horses for show jumping. After weaning the foals we bring them, to grow further, to our location in Veeningen. We start training the horses at the age of 4 . To train them further for the International sport we work together with excellent international riders like Michael Greeve who owns Michael Greeve Sportpaarden in Veeningen, Netherlands and Mark Bunting who owns Mark Bunting Horses in Warnsveld, Netherlands. . If you have any questions about our horses do not hesitate to contact us.